Order must be submitted day before to the 15-hour Mon.-Fri . Within 30 minutes service has confirmed the availability of ordered products / services and confirm the time of delivery. After confirmation of availability , the client must make payment by credit card or bank transfer till 17-th the day before. 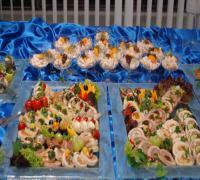 delicious appetizers, which emphasize each meeting. Suggestion for those who appreciate elegance. Carefully cut and arranged on metal platters snacks, meats, cheeses, will ensure that your contractors will be pleasantly remembered branch meetings, conferences and trade fairs.